Greetings, Final Fantasy Record Keeper lovers, and welcome to the first installment of Final Fantasy Unionâ€™s Record Keeper Update. Before we kick things off, one important part of this will be to ensure that these updates are to your tastes - we want your feedback! Record Keeper is a game that constantly evolves; every week brings a new event, every month a new set of trials, and the list of Realm Dungeons grows ever longer. With so much to do, we here at Final Fantasy Union want to provide you a look at whatâ€™s ahead so you can better prepare your party - in keeping with the sort of coverage Katie provides for Final Fantasy XIV. In order to do this better, Iâ€™ve prepared a short survey so you can tell us what sort of Record Keeper content youâ€™d like to see here. Whether you only checked the game out once, dabble in it occasionally, or play it fiendishly every day, please take a moment to fill out the survey below. 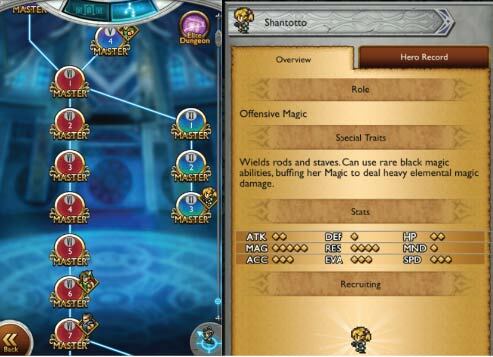 With the Dungeon Update last week, Shantotto has been added to the game - meaning that FFXI has arrived and realms for all fourteen core games are now active. In commemoration, a fourteen-day login bonus campaign is underway, and special accessories from each realm are available in the Gyshal Exchange (including some given as rewards from Ultimate bosses, like Squallâ€™s Necklace which gives +30 ATK). Accessing the FFXI dungeons requires beating the first VI dungeon, so most players should already be able to jump right in. Thereâ€™s currently only three dungeons in this realm (and of course their Elite counterparts), and Shantotto is a First Time Clear reward for the third dungeon. She can use 5* White Magic and 4* Monk, but youâ€™ll have to wait a little while for her Memory Crystals to be added. Final Fantasy XIâ€™s first representative can be unlocked pretty early on in the Realm Dungeons - you can probably access these three dungeons already. Her Memory Crystals wonâ€™t arrive until the Burst Bonanza festival, and to date sheâ€™s the only XI character in the Japanese version. The Nightmare Dungeons are a daunting challenge, and Juneâ€™s could be particularly demanding. Those who wish to challenge Neo Bahamut for the components to summon it have their work cut out for them. Neo Bahamut is a 6* Summon ability which deals three non-elemental hits to all enemies (while the 5* Bahamut is only two hits). However, in order to obtain the Neo Bahamut Record required to craft it, you must defeat the dragon itself - and if you want to Master this battle for other valuable components, you cannot use physical attacks or black magic! The pool of characters with access to 5* Summon abilities, and thus receive a boost in this battle, is relatively small (Arc, Rydia, Krile, Terra, Aerith, Rinoa, Garnet, Eiko, Yuna, Ashe, Hope, and Tyro) and summon abilities are notoriously difficult to hone, so this may take some time to overcome! As with previous Nightmare Dungeons, there will be a limited-time Lucky Banner Draw related to the new Nightmare - a one-time chance at a half-price 11x relic draw where every 5* drop is guaranteed to be a unique soul break for 5* Summon users. The banner includes practically every relic for these characters, and a â€œKeeperâ€™s Dozenâ€ draw for 25 mythril is a pretty sweet deal, so consider drawing here. And of course, for the period that the Nightmare Dungeons are available, all previous Nightmares will re-open so you can continue those challenges. Mastery on the battle with Neo Bahamut requires you to avoid physical or black magic attacks, which limits your options. The White Mage spells Holy and Diaga are viable, and you should take a look at your summons as well. These take considerable resources to hone, so you might want to hit the Daily Dungeons before the Nightmares return. As tempting as a half-price draw is, you may want to consider holding on to that mythril, as another big festival is almost upon us: the Burst Soul Break Bonanza. Similar to the Super Soul Break Festival back in March, five sets of special Orbfest dungeons will be available, offering increased drop rates for valuable crafting components like Major orbs. These will be accompanied by five relic banners featuring many coveted soul break items, particularly some awesome new Burst Soul Break techniques. The exact lineup of relics is unknown, but in Japan this event included Cloud and Yunaâ€™s Bursts; new bursts for Paladin Cecil, Bartz, Tidus, Terra, and Tyro; the priceless Sentinelâ€™s Grimoire and Stoneskin II soul breaks for Tyro and Ysolda; and other recurring prizes such as Yuffieâ€™s Wutai Headband, Ramzaâ€™s Platinum Sword and Grand Armor, and Leonâ€™s Golden Armour. 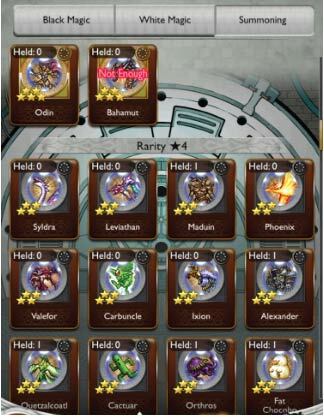 Luckily, all players will be receiving a 10 mythril gift from the developers soon as a reward for using the Final Fantasy Portal app, and a special Gilgamesh-themed event will occur at the start of July with another large portion of mythril up for grabs (along with some powerful accessories). In the meantime, consider holding on to whatever mythril you have for the time being, unless you feel strongly compelled to pull on a banner before then. Keep an eye on Final Fantasy Union for news on this event as soon as itâ€™s available! Sabin & Edgar break the second level cap! Recruit Braska and get a younger Wardrobe Record for Auron! Thatâ€™s all for this month. Be sure to fill out the survey, and keep an eye out for details on the Burst festival! 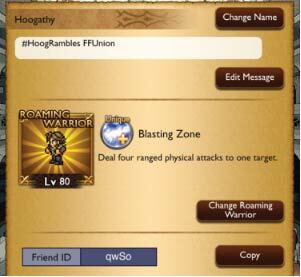 In the meantime, tell us in the comments below: what is your favourite party in Record Keeper? In need of some powerful backup? My Squall is at your command. A Canadian writer and geekdom enthusiast, Chris has never found a Final Fantasy he couldn't appreciate. If he were to choose a Job class to represent him, he'd like to say Paladin, though Scholar is more likely. Find him on Twitter.